Sparta due to its constitution would have two kings rule over the state. These kings working in partnership would share their duties, and by the nature of the dual leadership would keep the other king honest. Both kings would ensure that one king would not abuse or obtain to much power, that they could cause hard to the state. The unique nature of the Spartan kings was impressive considering all the other Greek city states of the time had elected officials in place of their kings. The Spartan kings themselves would come from two bloodlines, two families, the Eurypontids and the Agiads. Even though these two families were not the names of the first kings, the two dynasties were named after them. Both of the two dynasties where believed to have started around the same time in the ancient Greek timeline. Due to the fragmented nature of information on the actual bloodlines of the kings of Sparta, it is difficult to name with true certainty. There are various lists of the kings that exist, and while it’s hard to define which is the most correct, it’s thought that some of the history may have been altered, watered down, or even enhanced over the passage of time. The Agiad dynasty started with Eurystene but was named after Agis the second king who was thought to have ruled for about 30 years. Agis was in fact the son of Eurstenes and inherited the lineage which then become known as the Agiad dynasty after his name. The Eurypontid dynasty is again reported to have started around the same time as Agis, and would soon pass to the third heir to the line Eurypon. After Eurypon ruled the dynasty it was then named after him. As the kings of Sparta, both rulers had certain roles they were required to perform or fulfil for the state. The Kings would command the foreign policies of the state, they would also satisfy religious needs and perform judicial roles when required. It was Aristotle himself who once said to be a king of Sparta, was ‘a kind of unlimited and perpetual generalship’, moving to the point that kings of Sparta had to be excellent warriors and also have a penchant for war and battle. While Sparta was very much a military unit, the kings of Sparta with their dual rulership had a unique influence over the people. In particular Sparta had some truly important kings in its time, which we will go into more detail with. King Leonidas of Sparta is of course well known as the leader in the battle of Thermopylae, where only 300 Spartans led by the king would do battle with ten times more Persian warriors. 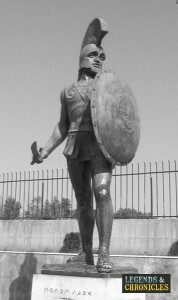 While Leonidas fell in battle many will not know that at the time he was reported to be around 60 years old, having shared the Kingship of Sparta for the last ten years. King Cleomenes was a Spartan king that ruled an overlapping time from the 6th to 5th century for what is thought to be around thirty years. During his time as king, Cleomenes was truly important to Sparta as a political and tactical genius. While during his time he set out to destroy the Greek municipality of Argos, he also was the mastermind behind the Peloponnesian League which helped and ensured the success of Sparta in the Peloponnesian War. Agis was a king of Sparta for only a short reign, for what was thought to be only four years and also at the rather young, early twenties age. Agis while not a famed warrior like Leonidas, or a tactician like Cleomenes I, was a true saviour of the traditional ways of ancient Sparta. At the time of 245 BC Sparta was in a state, the ancient ways had gone, and the wealth was unevenly distributed. Agis would offer to donate his lands between the Spartans and the Percoli in an attempt to more evenly distribute the wealth and reduce the materialist direction Sparta was heading. While the twin kings of Sparta, the descendants of the Eurypontids and the Agiads fore bearers found their power would dwindle over time. Slowly the ephors, the ‘ones who oversees’ would grasp control from the once mighty kings. The ephors unlike other citizens never had to kneel to the kings and slowly they would move to become a dominant force. Their decision making powers even riled one king so much, Cleomenes III, that he had their standing abolished in 227 BC. The unique nature of the Spartan form of rule already marks its kings as different from others. The duel ruler ship was intended to ensure that no one king could make a decision that was wrong. Whether in practise this worked we can only imagine, however Spartan history is marked with kings that the Spartans would follow, from the mighty battlefield warrior Leonidas to the thoughtful and magnanamous Agis IV.